This Friday’s letter is P.
I admit it, I subscribe to the “Patch”. Not only do I subscribe, I also get alerts on my cell phone whenever there is breaking “ news” . The Patch reports on local town news. I should point out that we live in a rather small town with a population of around 20,000. We have a large senior citizen community. There are six Active Adult complexes which house over 5,000 people. More often than not, there are slow news days. Although there are some serious articles posted on the Patch, I find myself giggling at most of the headlines. 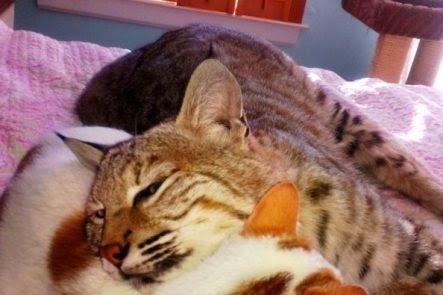 A recent ongoing story revolved around a missing pet bobcat. How do you get your local town news? Patch.com is an independent US local news and information platform, primarily owned by Hale Global. As of June 2013, Patch operated some 900 local and hyperlocal news websites in 23 U.S. states. Patch Media Corporation is the operator of the service. Sounds like a good way for you to get the local news; I always like to read some human interest stories in the newspaper rather than all serious, sad news. I don't get much local news these days, the town I live in used to have a newspaper that came out twice a week that carried local news but it folded a few years back and the San Diego paper is just so big it doesn't cover lots of our part of the county stuff going on. Check out the Patch. You might be surprised to find one that covers your area. What I like about the Patch is that it covers the news almost like a nosy gossipy neighbor would. I'm going to check it out, but I doubt it reaches rural eastern Oregon. I'm still drawing a blank for P.
It is getting more and more difficult for me as we get to the end of the challenge. Q??? How big was that toddler?? Those doors aren't that big. I just read the article and couldn't read the comments. I'll go back and watch the video. Yeah, that’s what I think is amusing about the patch, it’s more gossipy.